Grammy Awards 2017 Live Blog: Winners List, Performances and More! 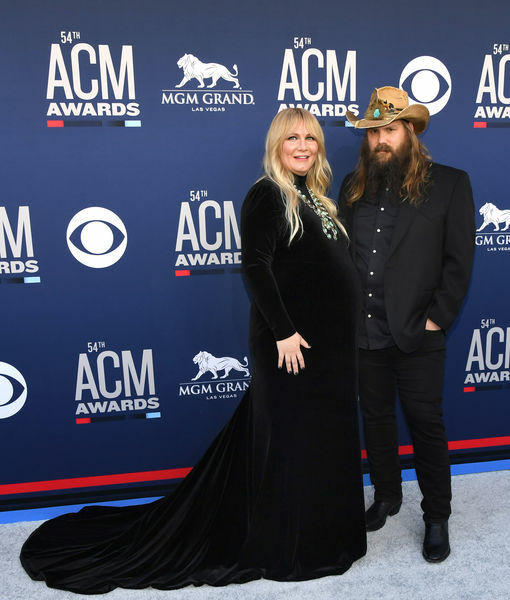 Host James Corden and a bevy of talented performers take center stage as the 2017 Grammy Awards are presented… and we are there to give you running commentary of Sunday night’s festivities! 8:37 PM: Adele goes back on stage to take home Album of the Year. 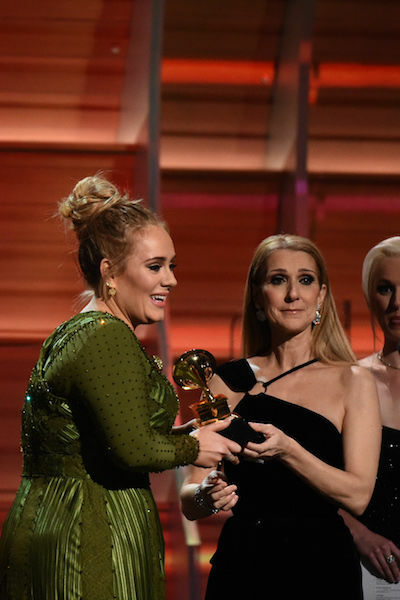 Adele got emotional while accepting the award and opened up about her struggles with motherhood. She said, "I'm very humble." She added, "Lemonade was so monumental, Beyonce." 8:35 PM: Adele wins Record of the Year. She gave a shout-out to Beyonce and said "I adore you and I want you to be my mommy." 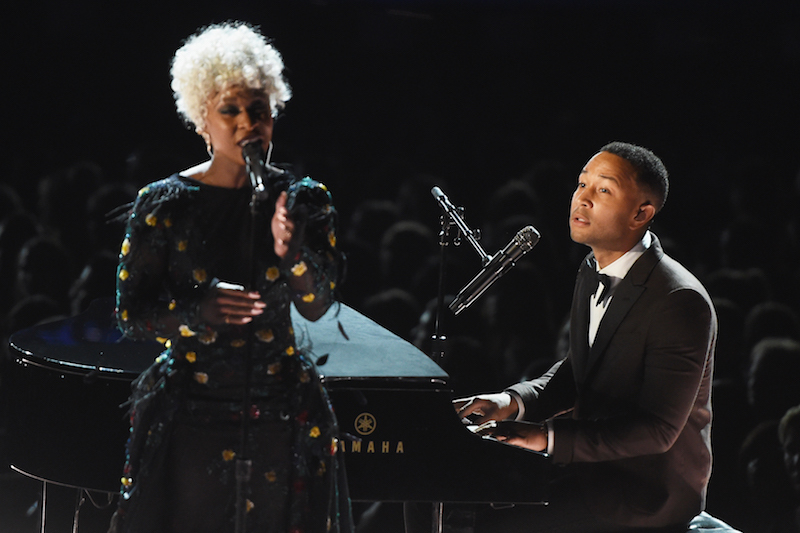 8:25 PM: John Legend and Cynthia Erivo Sardi perform "God Only Knows" to honor lost musicians. 8:19 PM: James Corden is about to introduce Kanye West, but stops midway because he "heard" wrong. 8:08 PM: Halsey and Jason Derulo introduce Chance the Rapper, who has won two awards tonight! Chance the Rapper took the audience to church with his performance! 8:06 PM: Pentatonix takes the stage to perform Jackson 5's hit song "ABC." 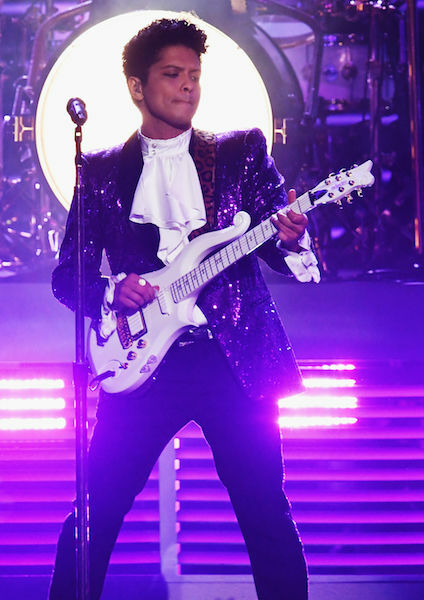 7:55 PM: Bruno Mars continues the tribute with a Prince inspired outfit. He sings "Let's Go Crazy." 7:50 PM: James Corden "wants to take us on a journey" with a Prince tribute. He introduces The Time. 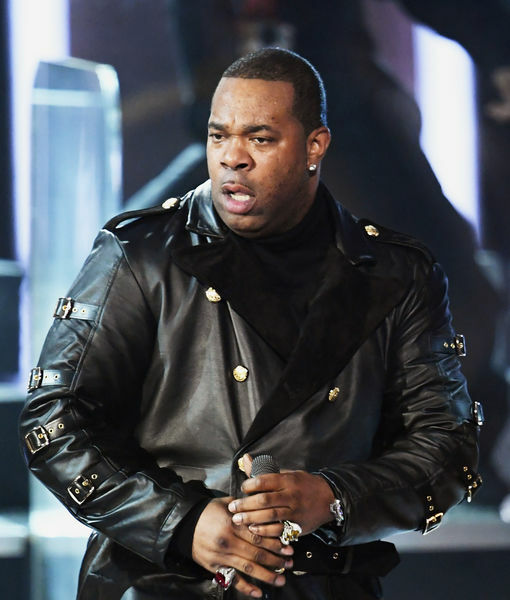 7:42 PM: During the performance, Busta Rhymes' made reference to President Donald Trump, calling him "Agent Orange." 7:39 PM: Solange Knowles introduces A Tribe Called Quest, who performed some of their hits. 7:35 PM: Celine Dion comes onstage to present the award for Song of the Year. Adele takes home the award for her song "Hello." 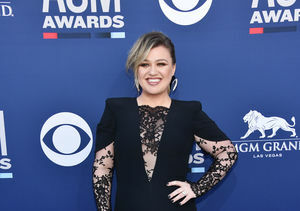 She acknowledged her George Michael tribute, sharing, "First of all, I have to apologize for swearing." 7:23 pm: James Corden tries to fit in with DNCE while introducing Demi Lovato, who is paying tribute to the Bee Gees. She is singing their song "Stayin' Alive." Tori Kelly performs the band's hit song "Tragedy," while Little Big Town sings "How Deep is Your Love." 7:12 PM: Dwight Yoakam introduces Sturgill Simpson, who is already a winner tonight. 7:10 PM: Gaga decides to do some crowd-surfing before returning to the stage. 7:07 PM: Laverne Cox takes the stage to introduce Lady Gaga, who is rocking a Metallica shirt and showing off her dance moves. 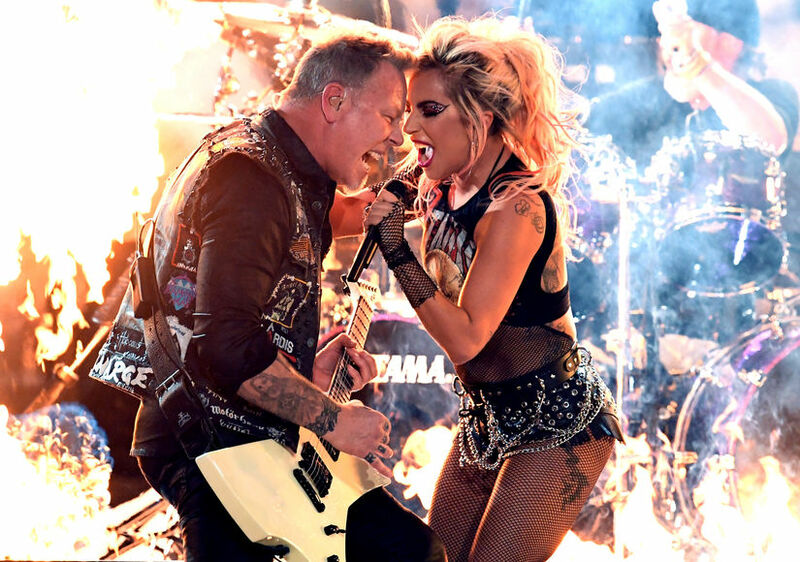 Gaga and Metallica frontman James Hetfield wow the crowd while being surrounded by flames. 7:05 PM: James Corden mentions that it is his parents' anniversary. 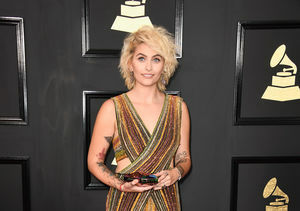 Both her mom and dad are canoodling big names, Heidi Klum and Nick Jonas. 7:02 PM: Taraji P. Henson gives out the award for Best Rap Album. And the winner is Chance the Rapper, who comes on stage for the second time tonight! He was surprised because he didn't "expect to win this one." He also gives a shout-out to independent artists. 6:49 PM: James Corden brings attention to the late George Michael, who died on Christmas. Adele is paying tribute to George with a rendition of his song "Fastlove." 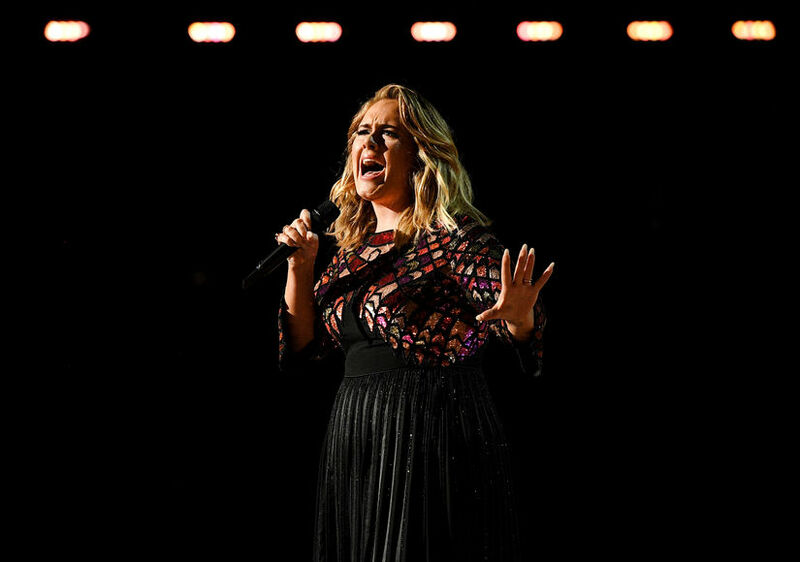 Adele apologizes for swearing but asks to start again. 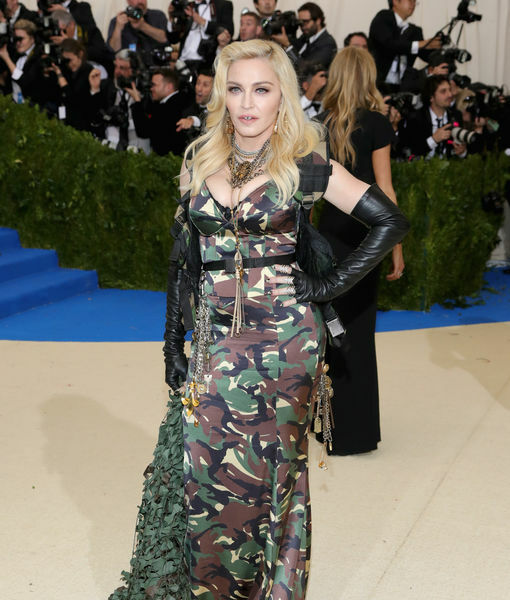 She makes reference to last year's performance, where she faced technical difficulties. 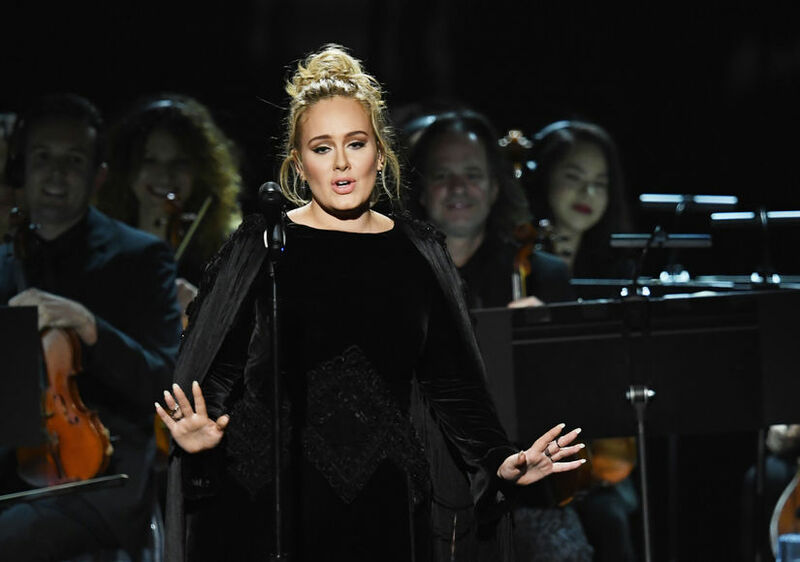 After the performance, Adele tries to hold back tears on stage while stars give her a standing ovation. 6:44 PM: Gina Rodriguez introduces Alicia Keys and Maren Morris, who are singing "Once." 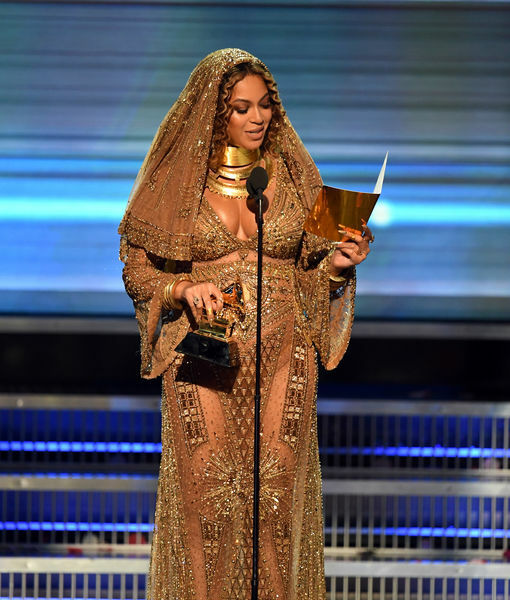 6:35 PM: William Bell and Gary Clark Jr. give out the award for Best urban Contemporary Album, which eventually goes to Beyonce for her album "Lemonade." Still in her performance outfit, Bey thanked her husband and "beautiful daughter." With her album, she wanted to make the album for the children of all races. 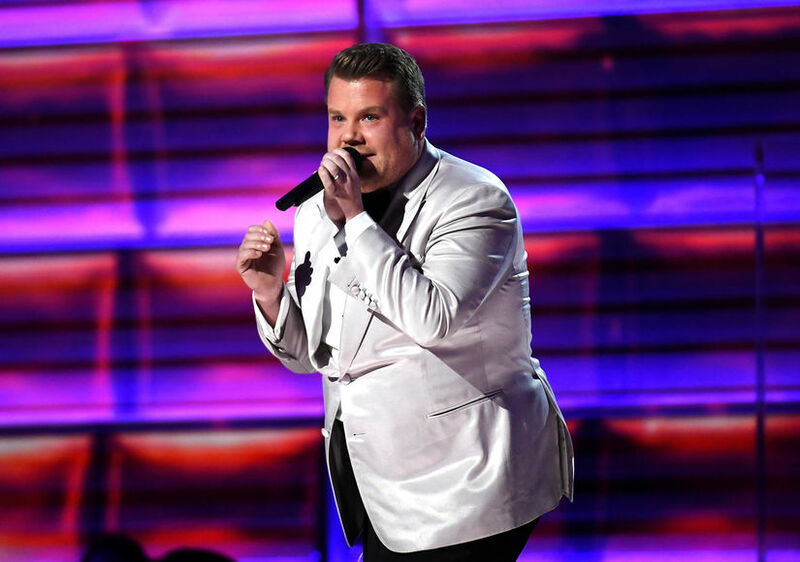 6:31 PM: James Corden calls Katy Perry's performance "incredible." He also made reference to politics by calling out "fake tweets," which criticized him as a host. 6:27 PM: Little Big Town introduces Katy Perry with their own rendition of one of her own songs! Katy rocks a suit and sunglasses while performing her new single "Chained to the Rhythm." 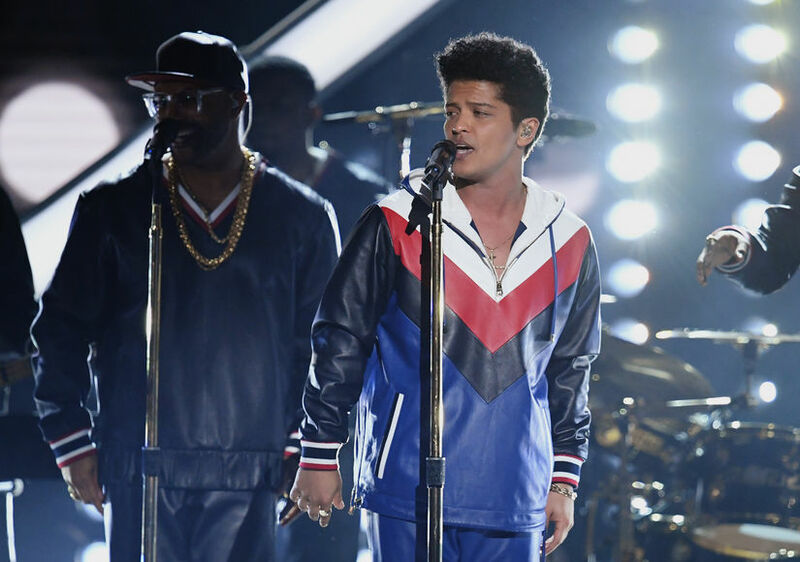 6:16 PM: Bruno Mars takes the stage to perform his new single "That’s What I Like." 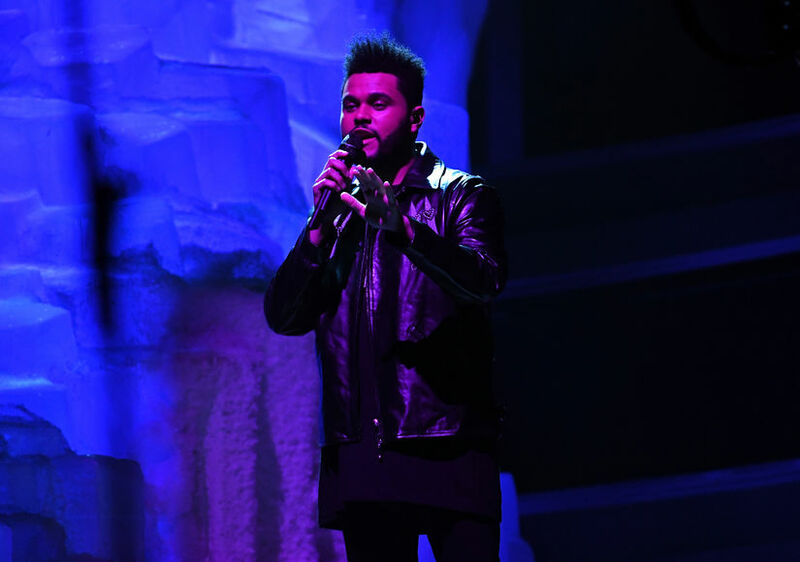 He put his vocals on full display while singing the track! 6:13 PM: James Corden does a plug for his hit show "Carpool Karaoke" and stops to chat with Jennifer Lopez. John Legend, Keith Urban, Ryan Tedder, and Jason Derulo all join in for an impromptu karaoke session. They are singing Neil Diamond's "Sweet Caroline High." Queen Bey's daughter Blue Ivy joins at the end of the karaoke session. 6:10 PM: Thomas Rhett and Camila Cabello are presenting the award for Best Country Solo Performance... The Grammy goes to Maren Morris. Maren apologizes for being "nervous" while taking her team. 6:04 PM: Jennifer Lopez and Jay Z were spotted giving a standing ovation to Beyoncé after her performance. 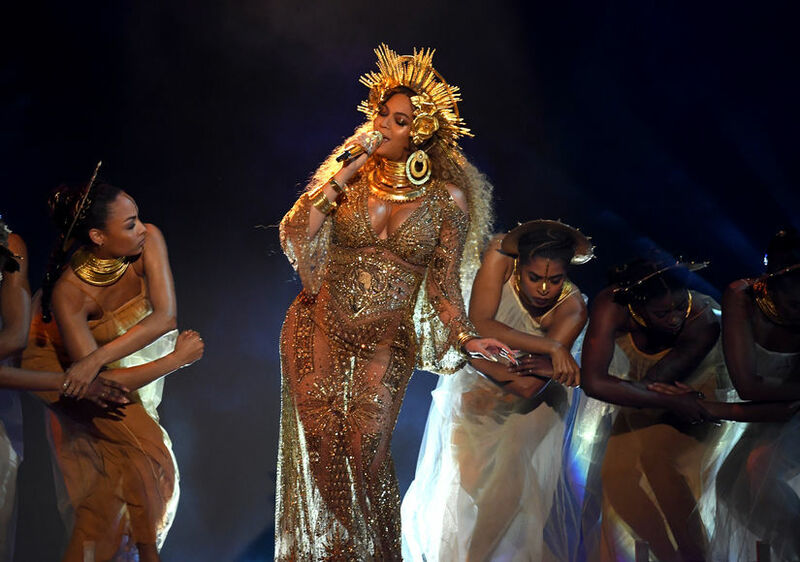 5:56 PM: Beyoncé appears on stage looking like a golden goddess! 5:54 PM: Beyoncé's mom Tina raves about her Grammy nominated daughter, who is performing! Before appearing on stage, a video of Beyoncé baring her baby bump is shown. 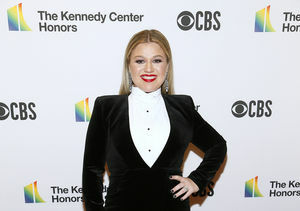 5:50 PM: Ryan Seacrest introduces Lukas Graham and Kelsea Ballerini, who are sharing the stage for a performance. 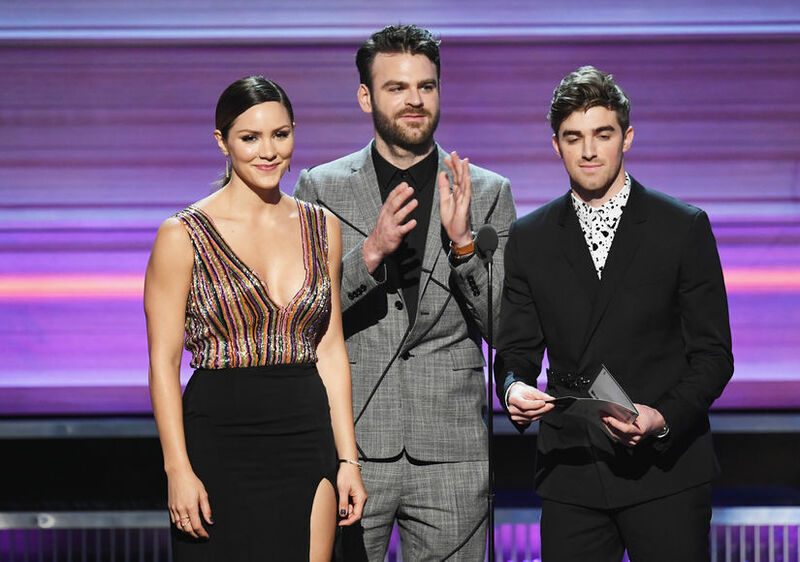 5:43 PM: The Chainsmokers and Katharine McPhee presented the award for Best Rock Song, which was won by the late David Bowie for his song "Blackstar." 5:38 PM: James Corden, who rocked black boxer, introduces Ed Sheeran, who is performing his new single "Shape of You." 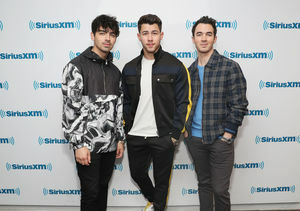 5:30 PM: Nick Jonas gives out the award for Best Duo/Group Performance, which goes to Twenty One Pilots for their song "Stressed Out." The guys decided to take off their pants and sport boxers onstage. They reflected about their dream of wearing their boxers to accept a Grammy. 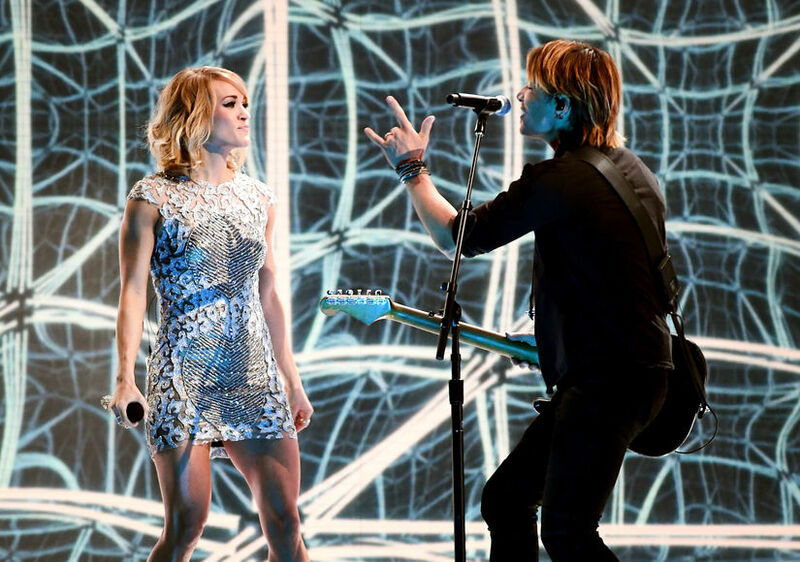 5:29 PM: Carrie and Keith showed off their fierce stage chemistry while performing! 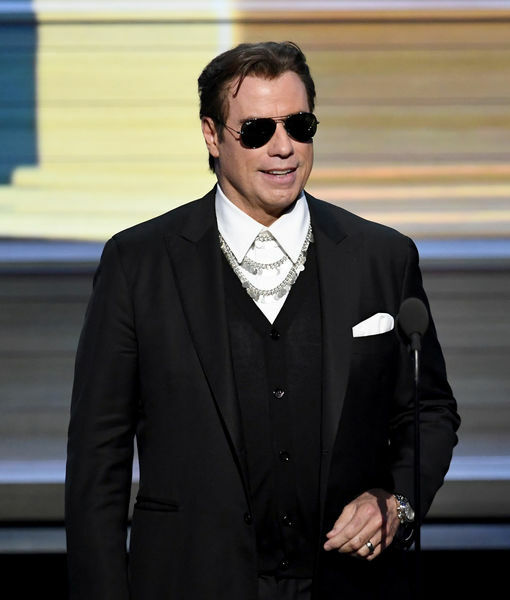 5:25 PM: John Travolta kept it cool on stage with sunglasses. 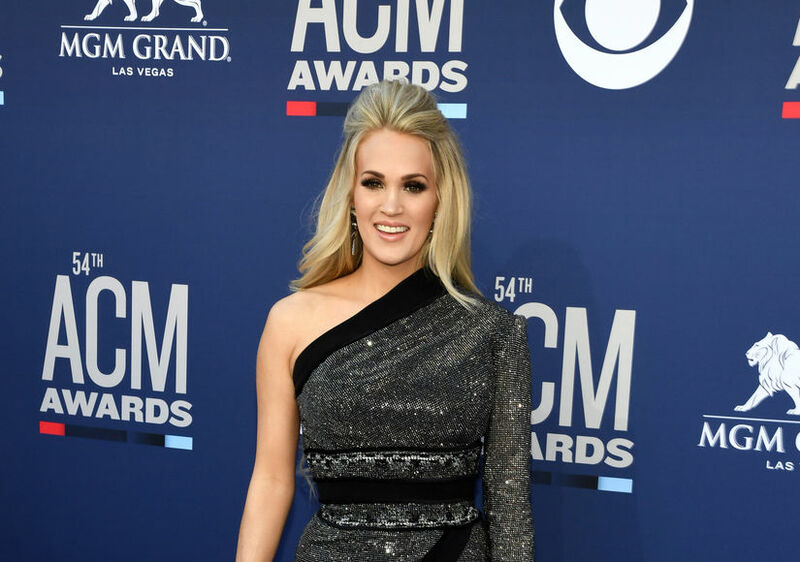 Instead of using the teleprompter, Travolta used cards to introduce Carrie Underwood and Keith Urban, who performed "The Fighter." 5:15 PM: Paris takes the stage to introduce The Weeknd, who is performing his song "Starboy" and "I Feel It Coming." 5:11 PM: Jennifer rocked a pink dress while presenting Best New Artist. 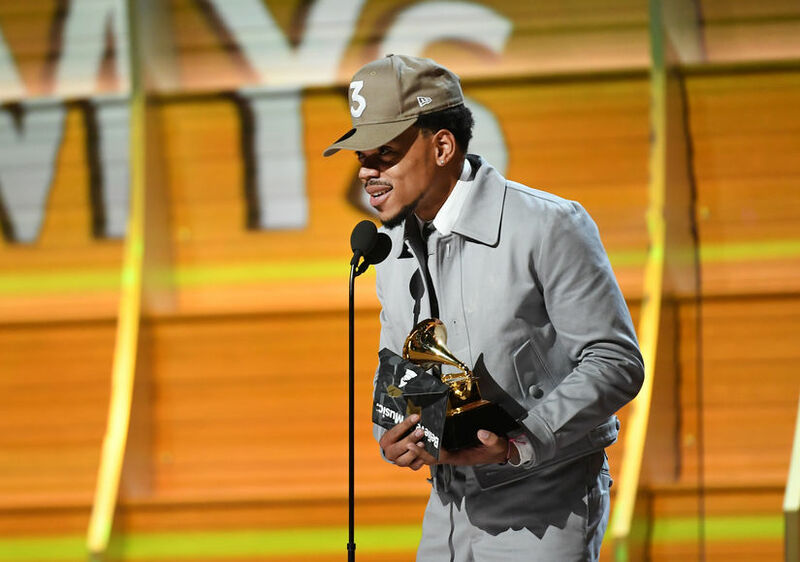 The Grammy went to Chance the Rapper! He thanked his parents for supporting him and giving a shout-out to Chicago. Though the music started playing, he joked, "I'm gonna keep talking." He added, "I claimed the victory in the name of the Lord." 5:10 PM: James Corden shows off his rap game before introducing Jennifer Lopez, who will present the first award. 5:06 PM: James Corden gets stuck while making his way on stage! After landing on the floor on stage, he showed his "frustration" since they already rehearsed everything. 5:01 PM: Adele opens up the show with her Grammy-nominated song "Hello." She ended her performance with a standing ovation from the star-studded crowd!